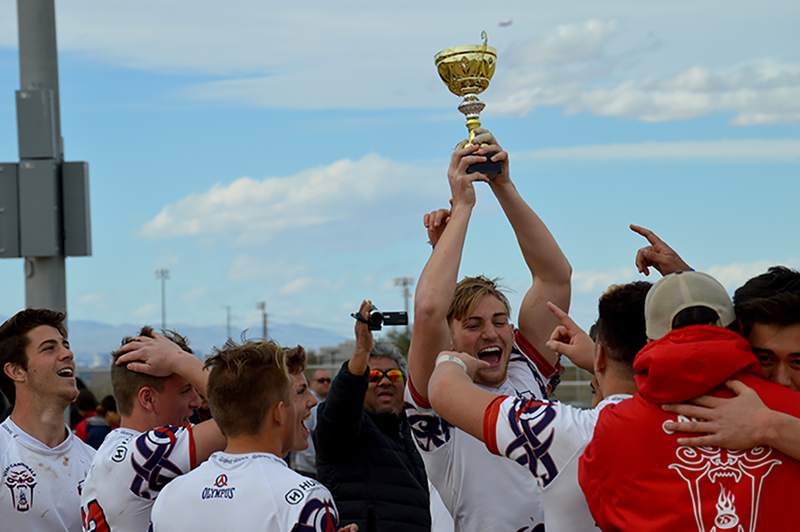 The Utah Cannibals claimed their first Las Vegas Invitational Boys Elite title this past weekend at Heritage Park in Henderson, NV beating the Arizona Bobcats 27-5 in the title match. The Las Vegas Invitational (LVI) is the largest rugby tournament in North America and is played alongside the USA Sevens international rugby tournament held annually in Las Vegas. The LVI is considered the premier amateur rugby event in the United States, featuring athletes and match-ups across a wide-range of rugby divisions and age groups. The 2018 Boys Elite field was one of the strongest ever with national All-Star teams from defending champions, Eagle Impact Rugby Academy (EIRA), regional invitational teams such as Atavus, Atlantis and DMV United, as well as All-State teams like the Arizona Bobcats and Utah Cannibals. Not to mention previous Elite Boys champions British Columbia, Canada. The Utah Cannibals went undefeated in 6 matches in the tournament including wins against the 2017 High School Rugby Championship winners, DMV United and the 2017 LVI Champions, EIRA. DMV United has bested the Utah Cannibals for the last two years in the final of the High School Rugby Championship in Philadelphia, PA and is typically a top 4 team at the LVI each year. With solid performances from all members of the team, the Utah Cannibals exceeded all expectations by comfortably winning all three pool matches to top the pool. The Utah Cannibals went on to comfortably beat EIRA 31-14. The other shock result of the quarter finals was the defeat of the other perennial finalist British Columbia at the hands of the Arizona Bobcats 24-7. That ultimately setup the final between the two All-State teams. Arizona’s path to the final was no less easy with a pool win over 2016 finalist, Atlantis, perennial finalist British Columbia in the quarter final and 2017 HSRC winner, DMV United in the semifinal. Utah cannibals however would control the final with tries from Leota Saili (2), William Tenney, Eli Pulu and speedster Taysan Hammer. The Cannibals gave up just one score at the very end to Arizona. Final score 27-5. The Cannibals net points difference for the tournament was 102. The Utah Cannibals was established in 2010 as a pathway to showcase Utah’s top up and coming high school rugby players. Since 2010, the Utah Cannibals have placed more than a dozen players in the HSAA program and many more have transitioned to Collegiate Rugby as well as Collegiate Football. Next up for the Utah Cannibals is the Rosslyn Park 7s in London, England. The Rosslyn Park 7s is the world’s largest school rugby tournament. This will be the Cannibals second trip to London. Despite not advancing out of the pool stage in 2017, the Utah Cannibals turns some heads with two big wins and a close loss against Cranleigh School, the eventual winners of the tournament for the second year in a row. The Utah Cannibals will field 12 of the 14 players from the Las Vegas Invitational. Kingi Fisiipeau (Herriman HS) is not available due to injury and Eli Pulu (United Rugby Club) is not available due to an age cut off at Rosslyn Park that is younger than allowed here in the USA. The mission of Utah Youth Rugby is to build character in youth through rugby. We do this by helping kids love rugby. To achieve this, Utah Youth Rugby sets out to acquire access to rugby fields, certify coaches and referees as well as organize numerous leagues and tournaments. Utah Youth Rugby believes that by fostering an environment in which participation in the sport of rugby, the life experiences of the youth athletes and families are enhanced. Utah Youth Rugby invites all to come play rugby regardless of race, religion, gender and socioeconomic status. Utah Youth Rugby, sanctioned by USA Rugby as a State Based Rugby Organization, was formed in 2010 to promote, serve, advocate, and organize youth rugby in the Great State of Utah. Since then we have grown from a handful of teams to over 60 High School and Youth teams for boys and girls of all ages. Our member clubs compete in 7s and 15s seasons throughout the year. Utah Youth Rugby is a 501(c)(3) non-profit organization. Is there a roster list for the Utah cannibals that could be added?